SAN DIEGO, CA (February 5, 2018) – At the upcoming NHRA Lucas Oil Winternationals, Beal Racing will return to NHRA nitro funny car competition to honor the team’s late founder, Chuck Beal. The car will feature a Bealmobile-themed livery to pay homage to Beal’s iconic alcohol-burning race cars of the 1970s and 1980s. The entry, now owned by Chuck’s grandsons, Brandon Welch and Tyson Porlas, will be driven by Welch. Veteran crew chief, Scott Graham, will tune the entry. 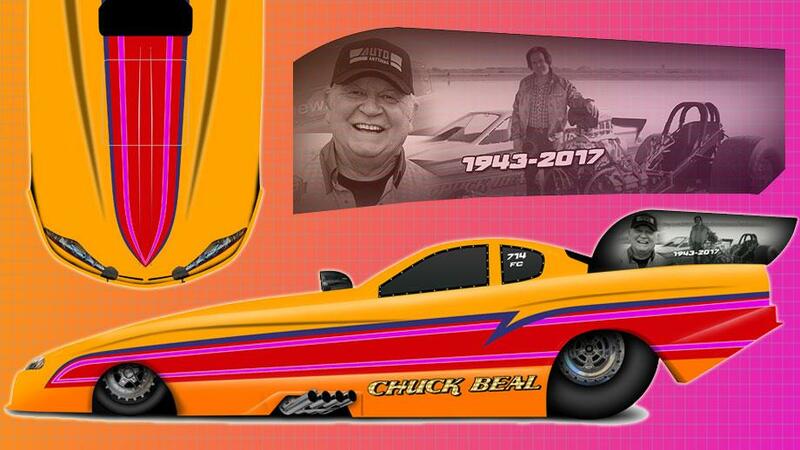 In the wake of Chuck’s passing, the crew of long-time Beal Racing volunteers collectively decided that the best way to honor Chuck’s legacy was to continue to field his race car. The Winternationals will be the maiden event for first-time car owners, Welch and Porlas. The second-generation racers are committed to keeping Beal Racing in nitro competition. Fans and racers are invited to attend a memorial celebration in honor of Beal on Friday, February 9th, at 6:30pm in the team’s pit area. Following the Winternationals, the team plans to continue to campaign part time in NHRA Mello Yello Series competition.